Iron, in it's various forms, is one of the most common and troublesome elements in water supplies across the US. As a major component of the earth’s crust, iron is one of the earth’s most plentiful resources. As rainwater infiltrates the soil and into underlying geologic formations, Iron is dissolved and transported into aquifers which serve as primary sources of fresh water supplies. When present in fresh water, iron content as low as 0.3 milligrams per liter (mg/l) or 0.3 parts per million (ppm) can cause discoloration of the water which is noticeable as a reddish brown tint. Iron is rarely found at concentrations greater than 10 mg/l or 10 ppm. Iron can be present in water as Ferrous Iron also called "clear water iron" or as Ferric Iron, also called "red water iron". Ferrous Iron is classified as soluble iron. Because the iron is completely dissolved, water containing Ferrous Iron is initially clear and colorless. When exposed to air such as in a pressure tank, storage vessel or atmosphere, Ferrous Iron is oxidized and becomes Ferric Iron (red water iron). The water will then become cloudy as the iron settles out of the water resulting in a reddish brown sediment. This sediment is the insoluble form of iron known as Ferric Iron; which will not dissolve in water. If you have determined that iron is present in your water supply, the next step is to determine the source. The source of iron may be from the corrosion of iron or steel pipes or other components of a plumbing system when the pH level of the water is is below 6.5. Water pH measured at this level or below is considered acidic. Iron is not considered hazardous to human health. It is identified as a secondary or aesthetic contaminant as classified by the EPA. Iron helps transport oxygen in the blood and is therefore essential for good health. Studies have determined that tap water throughout the United States accounts for approximately 5% of the daily dietary requirement for iron. When dissolved "Ferrous Iron" is present in drinking water it will cause a disagreeable, metallic taste. When used to make coffee, tea and other beverages, it produces an inky, black appearance and a harsh, unacceptable taste. Vegetables cooked in water containing excessive iron turn dark and unappealing. Iron concentrations as low as 0.3 mg/l will leave reddish brown stains on fixtures, tableware and laundry and can attach to the inside of plumbing pipe as mineral deposits. These mineral deposits and staining can be rather difficult to remove and often require a product containing iron removing chemicals. When these deposits break loose from the interior wall of water piping, it results in a rusty discoloration the water supply. 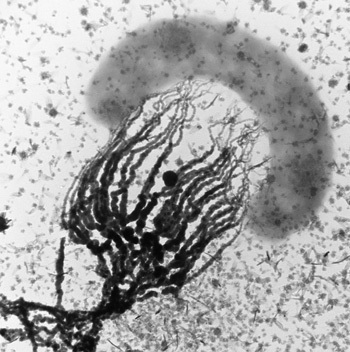 When iron exists along with certain kinds of bacteria, problems can become even worse. Iron bacteria in wells do not cause health problems, but they can be unpleasant and effect plumbing fixtures and piping systems that can be expensive to repair. Bacteria utilize the iron, resulting in a reddish brown or yellow slime that can clog plumbing which can lead to diminished flow rate from wells and springs and can cause the water to have red, yellow, or orange tint. 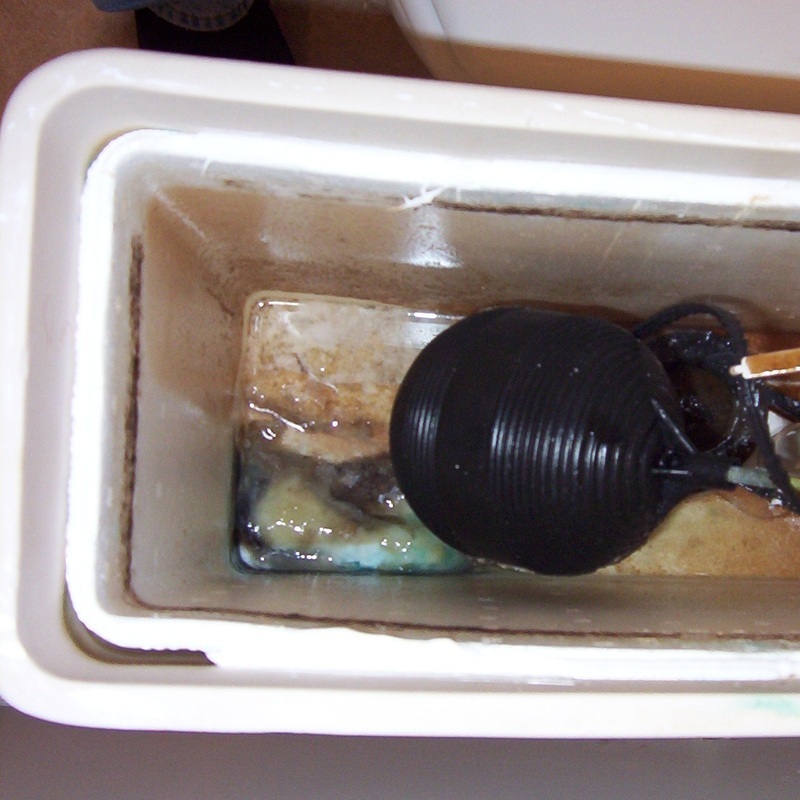 This slime or sludge is most noticeable in the toilet tank. Removing the lid from toilet tank is a simple way to determine if iron bacteria are present. In addition to the slim build up the presence of iron bacteria may cause an offensive odor which may resemble fuel oil, cucumber, or sewage. It is not uncommon for the odor to be noticeable only in the morning and/or after similar periods of non-use. When a disinfectant such as a chlorine tablet is used in the toilet tank, this sign of iron bacteria might not be apparent. Since iron combines with different naturally occurring organic materials; it may also exist as an organic complex. The combination of naturally occurring organic material and iron can be found in shallow wells and surface water. This type of iron is usually yellow or brown but may also be colorless. Testing water to determine the extent of iron and possible treatment solutions should begin with a test for iron concentration. Our free standard test will provide an accurate assessment of the types and concentration of iron present in your water supply. Contact us today to schedule your free water test and take the first step to improving water quality. If the source of water is a public water system and you experience iron-related problems such as we have described above, it is important to contact a utility official to determine whether the red water is from the public system or from your home’s plumbing or piping. Determining the most effective way to manage an iron water condition will depend on several factors which will be determined based on results of a water analysis. It is important to have an complete and accurate assessment of current water conditions in order to effectively filter or treat the water. Additionally, we need to consider the level of finished water quality that is necessary for your situation. 1. What form(s) of iron is present in my water? 3. Will the treatment system provide adequate flow rate to meet the needs of my home or business? 4. Are there other conditions present to consider that may effect an iron treatment system? 5. Is filtration or conditioning system the best solution for your situation and needs or would the construction of a new well be more cost effective than a long-term iron removal treatment process?